1. Peel and dice onions. Roughly dice speck. Wash radicchio, dry and slice roughly. 2. In a pot, heat some olive oil and butter and add half of the prepared onions. Fry until the onions turn golden brown, then add some rice and stir in well. Pour over the vegetable stock and let it cook for about 10-15 mins, stirring occasionally. Add salt as needed. 3. While the rice is cooking, heat in a pan some olive oil and add the rest of the onions and speck. Sauté until the onions tenderize and the speck fries up, then add sliced radicchio and mix in well. Season to taste with salt and pepper and let it cook for a couple of minutes, until radicchio wilts down. Mix with the rice and leave some on a side for as a topping. 4. 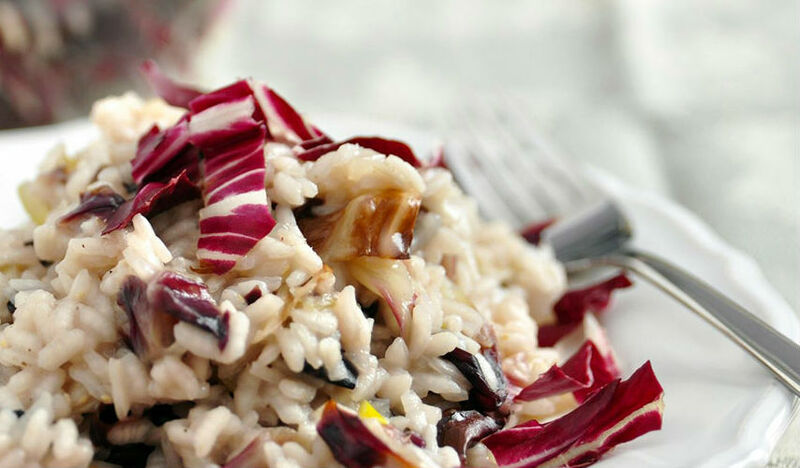 Place the risotto on a plate, topped with the rest of the radicchio and speck and generous handful of grated parmigiano reggiano.